You can chose to display icons at 16 pixels - 64 pixels. Files and folders can be registered with aLunch as well. Folders will be opened in the Finder. Different categories can be registered by using groups and separators. The "application menu" is clicked and all the applications can be hidden. aLaunch menu can display a checkmark in a launched application. A hot key is set up and the contents of the specified menu are displayed in an launcher window. Starting and closing can be performed in key operation. 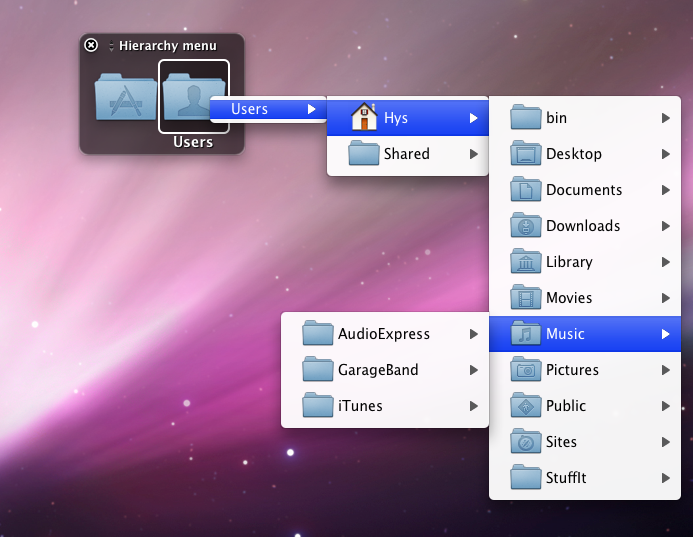 Supports hierarchical display of folders. The icon displayed on a menu can be changed and it can indicate by classification intelligibly. The file of the "icns" form which users prepared uniquely can also be registered. A launcher window corresponds also to drag and drop. You can also follow a hierarchy of folders. aLaunch for Mac can be operated by iPhone / iPod touch. At Mission Control and Show Desktop at Exposé, display the calendar quickly. You can change the colors, fonts, shadows, box lines easily and intuitively. Depending on the desktop pictures and settings that you choose, you can create your totally diverse and unique designed calendar we have ever experienced. Display your calendar on your original desktop picture. Though this software is freeware, please consider donating if you find this software pleasing. Thank you. Please change net.mactips-lib.aLunch.plist in a /User/Home/Library/Preferences/ folder into net.mactips-lib.aLaunch.plist. It corrected with flicker in Launcher window. The bug of several of Launcher Window is corrected. Adjustment of a Recent application menu. Bug fix of Fast launch menu. We coped with the sort of the list of application. aLaunch is compatible with OS X 10.8 Mountain Lion. The problem which cannot delete an Group icon is corrected. I added icon view to Fast launch menu. I changed so that Preferences could be closed by ⌘+W. The application of the item list was changed so that it could delete in delete key. From this version, supports Intel CPU only. Application is also set only to Intel CPU. From thisversion, the certificate is signed in My Developer ID. Improved compatibility with the OS X 10.7 Lion. Adjustment of Item list of Preferences. Because I became the architecture only for Intel by a mistake, build again. The show/hide option of the icon which can check active application/folder were added. ※ If you use aLaunchController, Version 1.1.0 is required. New : aLaunchController of iPhone and iPod touch application was released. aLaunch can be operated from iPhone and iPod touch. It is sale in App Store. Added : An aLaunchController dedicated server is added. Changed : Optimization of a function which opens a group at a stretch. Added : A check mark is displayed on the active application. Added : A check mark is displayed on a folder on display. The problem forced to terminate is corrected. Bug Fix about the display of a menu. It corrects so that the added icon may be reflected by the icon item of Preferences. Bug fix : The display of a launcher window. In a launcher window, when a group is changed, it changes so that it may display again. Improvement in the speed of a launcher window. A little accelerated is display of a hierarchical menu. The animation when calling a menu with a hot key was changed. The application menu used recently is added. In addition, two or more fine change etc. Rotation of an icon is abolished. Application name change from aLunch to aLaunch. Support OS 10.5 or later changed. Abolish the automatic update real time menu item. Bug Fix of two affairs. Traditional Chinese localization resource is added. The function which updates a menu automatically is added. The processing method at the time of opening the alias of volume is changed. The addition of animation. In a launcher window, it corrects so that the alias of volume may be opened. Bug Fix of one affair. The problem forced under a certain conditions to terminate is corrected. The label name of a group icon can be freely edited now. It enabled it to resize the window size of Preferences "Item list." Adjustment of the hierarchical menu of a launcher window. It changes so that change of aLunch icon may be reflected immediately. Fast launch menu corrects the problem which did not recognize the separator. When the folder is registered into the launcher window, the function which displays a hierarchical menu by right-click is added. Slight performance, such as optimization of Preferences, is improved. The problem it becomes impossible for a launcher window to close in a part of environments is corrected. When display specification of the launcher window is being carried out at the subdisplay, it changes so that the display position may be memorized also after making it a single display. Return to icon size of default size with the "esc key" is added to Launcher window. When the menu display is specified with the hot key, the item which closes a menu is added. Launcher window keyboard or mouse to expansion and reduction adjustment process. Italian localization resource is added. The menu application name to the localized name appear correctly. German localization resource is added. Added a not close option of Launcher window. The item list to adjust preferences. The display of a launcher window is corresponded to a dual display. The problem which had not restored the position of the launcher window is corrected. Spanish localization resource is added. The icon size which can be displayed with a sub menu was increased to 4 kinds. The menu which changes the group displayed on a launcher window is added. The menu is added to the item called with a hot key. Bug fix in two places. The problem which had crashed when it updated from 3.3.0 or lower version to 3.4.2 is corrected. Launcher window to abolish the border area and how to adjust the display window. Launcher window automatically update the list when you select the item to appear. The group icon of default is integrated into the icon tab. Adjustment of processing when drug & is dropped and it adds it to group list. Bug fix when group list new is added. The size of the Fast launch menu is fixed to 16px. Change in group icon tone and kind of adjustment. The Archive icon is added to the group icon. The item that can name an original name to group icon List17 is added. Bug fix of a font during group list editing was white. When a configuration is chosen, a window modifies the problem indicated to many. Modify the problem which the custom icon of the list 16 of the group icon isn't reflected on. Added a group icon for Hot key. Modify it not to indicate Thumbs.db. The modification of the English localization. It enabled it to customize a group icon freely. 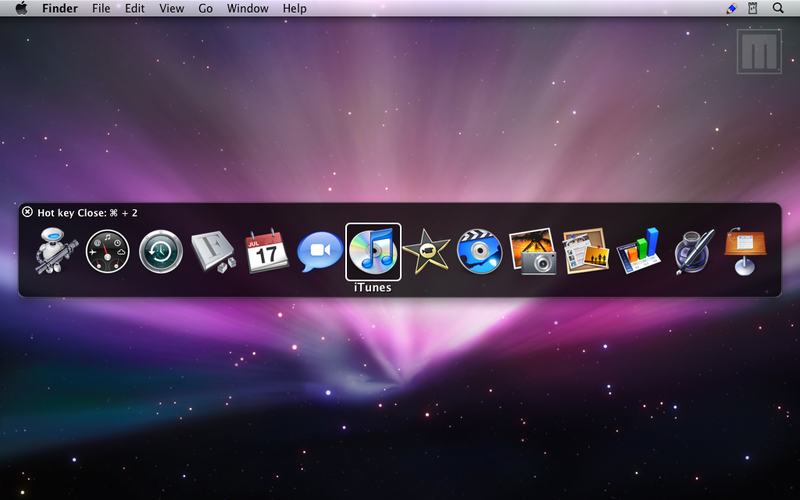 It set up with the icon tab of Preferences. I had Mr. K2 (K2DesignWorks) make the pencil icon of the group icon of the default and the menu bar. When there were no contents of the folder, it tried to indicate "No items" by the menu indication. It tried to reflect a change at the time of the menu renewal when the contents of the folder added to the group list by drag and drop were changed. It came to be able to carry out the hierarchical display of the menu item (folder). It becomes effective by ON about the check box of the "group name" of an item list. Bug Fix of a launcher window item name display. A tool chip is abolished. The Fast launch menu was added. The registration item of the "Fast launch" group of an item list is displayed on the first menu. The adjustment of the launcher window. The size of a launcher window and an icon was adjusted automatically according to the size of a main display. Adjustment of a mouse cursor. Bug fix of Updating menu. Added a new features to launcher window. The active application displays it with semitransparency. If the file does not exist "?" displayed. The adjustment of the indication method of the launcher window. If no frame of the window to hide shadow. The change of the indication method of the item choice frame of the launcher window. The font size of the list title of the launcher window and adjustment of the indication. Initial when you start emitting the cause of the error log to correct. Update items, the previous day when the check had not been updated to fix a problem. Quit menu, Added an show/hide option. Added an update item to Preferences. It came to be able to set it in detail. Added the option which shows the screen center a launcher window. The problem that an auto update doesn't function is corrected. A few minor fixes and change of the part processing method. Hot key window of the folder is open to change. "Item list of Hot key"(Pop Up Menu) bug was corrected. Hot keys call window has been added. Hyde extension items to be changed. The addition of the French resource. Mac OS X 10.4 and 10.5 dedicated to the optimization. Code slight modification. Memory consumption has been reduced and correction of memory leak. Resource sort of minor changes. -Attention please.This version, the operating environment is Mac OS X 10.4 or later. -I am sorry, 10.3 support is the lasts in this version. The person using after 10.4 does not have need. To select the paste menu when there is no copy item, it changes. -The copy paste function doesn't use the paste board of Mac OS X. It is localize in Japanese because it had forgotten localize. The deletion item is added to the context menu. The problem that two or more items have been selected is corrected when the item of the item list is dragged and it moves. It corresponds to the copy paste of the item between items. It corresponds to two or more of item of the item list deletions. The memory leak is corrected. The item etc. adjust the operation when adding, and deleting it to the list. The update processing of the menu is optimized. The tool chip display is added. Icon corresponds up to 256×256 pixels. The item of the first hierarchy of the directory that does Drop is reflected in Launcher menu. The folder including the subdirectory is registered as an item. The problem that a part of file did not open is corrected. The folder menu is abolished, and integrated into the launcher menu. To open the file, it improves it. "ALunch homepage" of aLunch of Preferences. The option to display the application under the start was added. -The application program menu under the start is concealed and all the applications are concealed for the click. -The application name is displayed on the foremost side by the click. -The application name is ended by command + click. The option of the menu list update was added. The option to start all the applications to which the group name was registered by command + click was added. The application name was added, and the original was added in command + click and the display option was added. The option to display all folders that registered the folder menu by command + click was added. Help of easy use was prepared in an Preferences. in the folder menu is not found by some causes (move, delete, and unmount). Additionally, change in internal processing method etc. 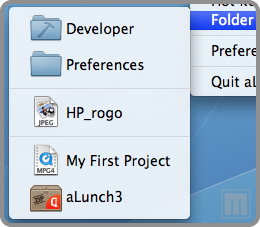 Display/non-display of the folder menu can have been selected. The application and folder O Canada can have been added by drag & drop. program folder separator was improving corrected. Improvement of the overall performance.